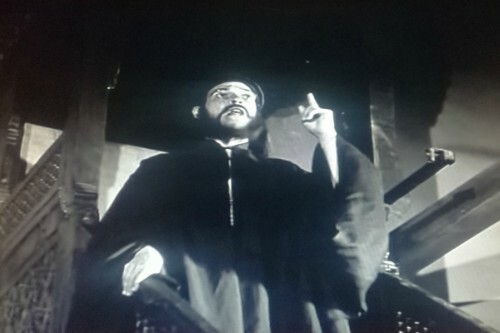 Towards the end of the film version of Egyptian Nobel laureate Naguib Mahfouz’s novel Bein Al-Qasrein (Palace Walk) a priest is seen mounting a pulpit in Cairo’s Al-Azhar Mosque to preach to the public during the Egyptian 1919 Revolution. As unusual as this scene was, it was astounding at that remarkable moment in Egypt’s history. The priest, Father Sergius, was known as the “preacher of the 1919 Revolution” during which the Egyptian people marched on the royal palace in Cairo and against the British occupation of the country. He later remained a symbol of national unity, writes Mohamed Afifi, a modern history professor at Cairo University, in his book Religion and Politics in Modern Egypt published by Al-Shorouk in 2011. Sergius was born in 1883 in Gerga in Upper Egypt and was the third generation of his family to become a Coptic priest. He went to the local kuttab (elementary school) and church and learned Christian hymns. In 1899, when he was 16, he travelled to Cairo to join the Coptic Clerical School. Having been born a year after the start of the British occupation of Egypt, Sergius shared with his generation the sufferings inflicted by the occupier. He witnessed the birth of the nationalist movement against the occupation and its suppression before World War I. It was no wonder that his generation led the 1919 Revolution when national hero Saad Zaghloul was exiled by the British. When the revolution erupted, Sergius was 36 years old and thus in the same age bracket as the Wafd Party’s second generation that led the popular movement and the revolution’s underground activities. At that time Coptic life in Egypt was also taking a new turn as a result of the efforts of Pope Kirollos IV, known as the “father of reform”, in addition to the spread of the sophisticated methods of Catholic and Protestant preaching. Both these things affected Sergius’ subsequent conduct. Many Coptic priests had earlier taken on preaching as well as laborious agricultural work in rural areas in order to make ends meet. This was not in line with the sophisticated culture of foreign missionaries that practised only the art of preaching. The establishment of the Coptic Clerical School thus brought about a development in Coptic methods. The spirit of rebellion appeared early on in Sergius’ life. In 1902, when he was teaching at the Clerical School, he led a rebellion by the students to reform the school and improve the conditions of its students. The authorities tried to quell the rebellion by calling the police, and the students approached Boutros Ghali Pasha, a prominent secular Coptic figure, to mediate in ending the disagreement. After graduating from the Clerical School, Sergius married in 1904 and was ordained a priest. He served in the towns of Zagazig, Fayoum and Minya until he was promoted arch-priest in 1907. In 1912, Sergius travelled to Sudan to become deputy of the Coptic diocese. It was in Sudan that Sergius’ nationalist role began. His arrival there followed a series of sectarian incidents in Egypt after the assassination of Boutros Ghali Pasha in 1910 and the convergence of denominational conferences in 1911. The tensions in Egypt then ricocheted to Egyptian expatriates in Sudan. Sergius recounted that the Coptic members of the Egyptian Club, which symbolised the unity of Egyptians in Sudan, left the club at this time and formed another by the name of the Coptic Library to convey that the once-united elements of Egyptian society were no longer so united. However, when Sergius was invited to give a religious lecture at the Coptic Library, he noticed a number of Muslims among the attendees and quickly changed the subject of his lecture to “Living in Peace” and called for amity between Muslims and Christians. He also successfully worked with Egyptian Muslim scholars in Sudan to restore the brotherhood among Egyptian Muslims and Copts and to help overcome the repercussions of the assassination of Boutros Ghali Pasha. He published the magazine St Mark’s Episcopate Lighthouse to express his opinions. However, this drew the ire of the British authorities in Sudan, especially after the eruption of World War I. They ordered Sergius to leave the country on 16 May 1915. Jobless, Sergius returned to his hometown of Gerga, where he lived on financial help sent to him by Sudan’s Copts. He then moved to Shubra in Cairo in 1917, remaining there until the end of his life on the pretext that his children needed to receive their education in Cairo’s schools. In 1919, Sergius’ national star began to shine. 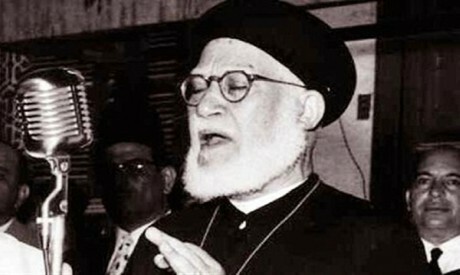 As a Coptic clergyman, his participation in the revolution was a symbol of national unity, and he was fully aware of the historic role he was playing since his participation in the events with Al-Azhar clergy was symbolic of Egyptian unity and proof that the revolution was not sectarian or non-progressive. Sergius was also aware of the important role the Copts were playing in the revolution by asserting unity among all Egyptians and rushing to help the homeland in its hour of need. Yet, Sergius’ involvement in the 1919 Revolution was a decision made on the spur of the moment. “My life was divided between studying, preaching and worshipping, until one day in 1919 when I was in my house, I heard noises coming from the street. Young men were shouting for the release of Saad Zaghloul and for Egypt’s independence. I felt as if a volcano had erupted. I rushed into the street and joined the demonstrators,” he later wrote. During the revolution that swept the country, Sergius marched with the protesters to the Al-Azhar Mosque. He mounted the pulpit and addressed the revolutionaries. He went on to preach at mosques and churches and lead the protests, especially those in the city’s main squares such as Opera Square where many of the demonstrations took place. In his speeches, Sergius’ oratory was flowing, pungent and thrilling. His work as a preacher had helped him to approach the people directly and to speak frankly to those from the middle and lower strata of society. In one speech at the Al-Azhar Mosque, he said that “one day as I was walking in Clot Bek Street in Cairo I encountered some children playing in front of their house. Sergius’ speeches were also known for their sense of humour. During one demonstration in Opera Square, he asked his fellow demonstrators to chant “long live the British” along with him. His captivating style was not limited to public speeches, however. Sergius used the same manner with influential leaders including Zaghloul himself. After his return from exile, Zaghloul asked Sergius to speak at an event honouring his return. In April 1919, Sergius was arrested by the British authorities because of his revolutionary activities and sentenced to exile in Rafah. This gave rise to protests in the Coptic Church, which sent a letter to Egypt’s then ruler, Sultan Ahmed Fouad, protesting against the arrest of one of its personnel. It added that it was the only authority that had the right to interrogate men of religion and protested against the application of martial law against clergymen. It requested that Ahmed Fouad should intervene and ask the British authorities to release Sergius and hand him over to the Church to investigate any wrongdoing. Sergius himself also sent a letter from his exile in Rafah protesting against his arrest to Edmund Allenby, the British high commissioner in Egypt. The letter, written in a sarcastic manner, ridiculed British attitudes, because Sergius believed his arrest and exile had gone against conventional norms since Ottoman decrees stated that a priest could only be imprisoned in a patriarchal monastery. However, none of the attempts to free Sergius were successful, and he remained in exile for 80 days accompanied by national leaders such as Mahmoud Al-Noqrashi Pasha and Islamic scholar Sheikh Mustafa Al-Qayati. Changes in Egypt’s political life after the 1919 Revolution minimised Sergius’ role, and after the adoption of the 1923 constitution, after which political parties were formed, Sergius found himself with little left to do. He was a man of God who found it difficult to engage in regular political life, and his personality was independent and full of a spirit of revolt. He considered himself to be a leader, so he found it difficult to follow in the footsteps of others, even in Zaghloul’s. More importantly, his cause of national unity was no longer the main cause after the revolution. Other issues surfaced, such as full independence, the evacuation of British soldiers, the Egyptian-British Treaty negotiations, the problems of the 1923 constitution, the adoption of the 1930 constitution, and the popular demands to go back to the constitution of 1923. Added to these things were the partisan conflicts and love-hate relationship between the pillars of Egyptian politics in the shape of the British, the royal palace and the Wafd Party. It was difficult for Sergius to belong, even as his fiery, passionate nature made it difficult for him to sit still. At that time Coptic reforms were going through a difficult phase, the Coptic denomination was suffering from internal problems, and there were perpetual conflicts between the Church and the Coptic Orthodox Lay Council. Sergius decided to dedicate all his energy to Coptic problems as a result. In 1936, Sergius returned to his political activities, however. He entered into a feud with the Wafd Party and its leader Mustafa Al-Nahhas and secretary-general Makram Ebeid. The Wafd regarded itself as the unifier of the Egyptian nation, while Sergius believed he had been “the first to call for unity among the two elements of the national fabric,” meaning the Muslims and the Copts. Sergius sided with the Saadiya, a political party that had adopted Saad Zaghloul’s name in its conflict with the Wafd. This party’s leaders, Al-Noqrashi and Ahmed Maher, were better than Al-Nahhas, he thought, and he also began to engage in fierce arguments with the Muslim Brotherhood, believing that this had been the reason behind the dissipation of the spirit of national unity that had been born with the 1919 Revolution. The disputes took on a religious tone as Sergius was a religious man who played a political role, whereas the Brotherhood was a religious group with political goals. Such arguments characterised Egyptian life at the end of the 1930s and early 1940s, with missionary groups playing greater roles in society. Some of those tried to convince Muslims to convert to Christianity, while a number of prominent Muslim writers became increasingly interested in Islamic topics. These things were coupled with the rise of the religious fevour of leading sheikhs as a result of the missionary groups’ writings against Islam. Unfortunately, Sergius joined such futile arguments, publishing articles in his magazine refuting claims by Islamic scholars against Christianity and later collecting these in books. Without realising it, Sergius had put on a sectarian cloak, and in 1935 he took up an offer from the Coptic Orthodox Lay Council to work as an informant against Christians wanting to convert to Islam. Sergius’ religious disputes with the Brotherhood grew sharper, and he accused it of persecuting the Copts. Hassan Al-Banna, the Brotherhood’s founder, published an article attacking Sergius under the title “What is better to Father Sergius?” Sergius later said that he was among the first to request the Egyptian government to ban the Brotherhood because he thought it posed a danger to the country. He felt that the Islamist current was rising and that neither he nor the Egyptian Copts would be able to find a place in Egypt if it was allowed to continue. In 1949, Sergius announced he was running for parliament, and his candidacy aroused questions about his bold return to political life. Sergius replied that he was doing so for the same reason that had led him to take part in the 1919 Revolution. The political arena had seen the emergence of new political currents with extremist views, he said, that would take away the gains of the revolution. He had a responsibility to “fight this obnoxious, retrogressive spirit”, he added. During the election campaign, he said he would work for the whole of Egypt and that as a man of God he would defend his denomination and work towards legislation in its favour. As the campaign drew to a close, Sergius struck a deal with the Wafd Party candidate, offering to give up his campaign for the lower house of parliament in return for being appointed to the Senate. However, while Sergius did his part, the Wafd did not, and he lost his electoral battle. With the coronation of king Farouk, Sergius and the majority of Egyptians pinned their hopes on the new king. Sergius used the opportunity of the king’s marriage to express his loyalty to one he thought could unite all Egyptians regardless of their religious affiliations. “The followers of the three religions are celebrating one feast: that of the birthday of king Farouk,” he wrote. Sergius’ sentiments changed with the eruption of the 23 July Revolution in 1952. One week later, he wrote an article hailing the revolution and demanding reform. However, the honeymoon between the revolution and the Copts was short-lived. Coptic leaflets condemned the Free Officers Movement that had led the revolution, accusing it of having ties with the Brotherhood. Making matters worse was the fact that the movement seemed to be unaware of the Copts’ real problems and internal differences. The Free Officers were more concerned with matters of domestic sovereignty and foreign relations, leaving the management of Coptic affairs to Coptic technocrats. Sergius wrote that the July Movement, like its predecessors, had been a disappointment to the Copts. His political activism then came to a close when the new authorities closed down his magazine, putting an end to one of the most important Coptic periodicals, and the Ministry of Interior put him under house arrest. In 1959, the state once again allowed him to preach, though it forbade him from discussing politics in his sermons. In his final years, Sergius’ health deteriorated, and he died on 5 June 1964 at the age of 81. His funeral started from his house in Shubra and processed to St Mark’s Cathedral accompanied by hundreds of Christian and Muslim mourners. The daily Al-Ahram mourned Father Sergius, writing that he had been the “jurist of the Egyptian nation” who had left behind a magnanimous patriotic and religious legacy.